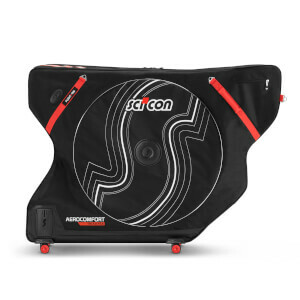 Designed specifically around the geometry of TT bikes, the Scicon AeroComfort Triathlon bike bag features a lightweight design with an integrated metal structure to protect your TT bike when travelling abroad. Constructed with a rugged and durable Nylon outer shell, the bike case features a thick layer of high-density foam padding to provide outstanding protection. 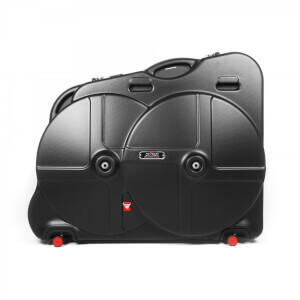 Tried and tested by professional Triathlon teams including BMC-Etixx and Trek Factory Racing, the case is easy to pack and enables you to be travel or race ready within minutes. Suitable for bikes with an integrated seatpost, the bike bag requires minimal disassembly of your bicycle and includes dedicated storage space for all bike parts. The internal strap system holds the bike firmly in place for extra stability and safety. The Antishock Bike Frame provides rigid protection of the bike frame by absorbing impacts. An additional padded Nylon protector with rigid inserts protects your shifters in transit. Aerobar friend - No need to remove the handlebar nor your aerobars. Just everything in place and protect with the aerobar protector. Bought this for international travel - so easy to use. Disassembly means taking wheels and skewers off - takes away the stress of getting bike packed and unpacked. Very satisfy with the quality of the bag. Easy to install my bike in to the frame. Hi, Just wandering how many days to ship this item to New Zealand and do uou have stock with this? Bike Travel Made SIMPLY Amazing! Purchasing this bag has changed my life. I travel a lot with my triathlon bike, and I used to travel with a hard case for extra protection, but that only resulted in frustration and snapped di2 cables from taking the handlebars apart (so much for hard case protection!). I went from dreading the bike packing and unpacking process, to loving the process with this Scicon bag. The process is so quick and, so far, my bike has traveled without any damage. It's not required, but I do take off my rear derailleur and pedals just for peace of mind (super easy to do), and I do add some extra foam padding just for extra care. I would recommend this bag to anyone because it's safe and incredibly easy. There's also room to put a few light weight items inside after the bike is packed. No more taking off my handlebars!!! Excellent big bag at a discounted price. 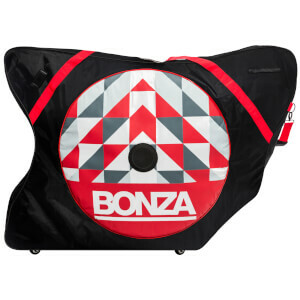 Great deal for a durable bike bag with all the bells and whistles. ProbikekitUK shipped quickly. Highly recommended. This bag is the best. The bag is all that you promised and more! The video to pack my bag was simple, instructional and easy. Wheeling my bike bag through the airport was a breeze, easier them my luggage. My precious bike was in perfect condition even after TSA opened it to check it out. I really totally happy with the bag and would highly recommend it. Superb quality and hassle free. 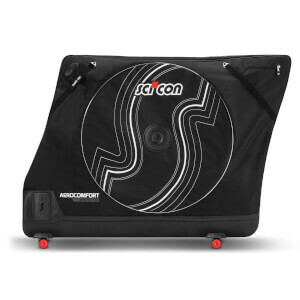 I bought this Scicon aerocomfort triathlon for my road bike with attached clip-on aero bar. it was so easy to pack my bike as it only took me less than 10 minutes by only removing the wheels and mount the bike on the antishock frame. The bag is well padded and heavy duty. There is still some space to stuff other belongings. The bike is securely strapped in the bag and almost no movement at all. I have traveled several time via airplane and everything was just fine, no complain yet. Scicon includes all the accessories such as frame pads, quick release skewers, antishock frame, rear derailleur guard, spare wheel, hand pump, and tsa padlock. Highly recommended for triathletes seeking for fast, easy, and safe bike travelling. I researched multiple travel cases for 2 months and decided on the right travel bag. I felt the Scion Triathlon bag was the best for what I need being mostly US travel and the least dismantling of the bike. Then I had to find out where to buy it. ProbikeKit blew away the other sites on price so I went with them. The only snag was US customs taking a day longer than they should have since this was shipped from Europe! In all it arrived within 7 days of the online purchase was a great experience. I'd recommend the bag and Probikekit. I bought this bag for air travel with my bike. Used it for the first time this last weekend. The video showing how to load your bike in the bag was easy to follow. Best things about this bag are that i felt my bike was absolutely protected, it was only 40lbs loaded with my bike, and it rolled like a dream. I would recommend this bag for anyone who wants to air travel with their bike. I shopped around and this was the BEST PRICE out there. This bike is tailored to tri bikes and that is the reason I purchased it. Not needing to fumble around with removing the handlebars and risk one more thing getting damaged was a major draw. The downside is that this bag is not tailored to fit a Trek SC, which is why I purchased this. It squeezes in at the handlebars and is loose fitting at the seat. I'll add that my bike is a size large, and smaller bikes may not have this problem, but the only place this bag is alarmingly ill-fitting is where it is specifically designed to fit different from every other bike bag. Other than that, this is a great, easy to use, ultra secure bike bag.